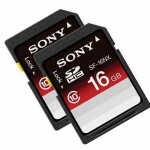 Here is your chance to stock up on memory: two 16BG Sony Class 10 SDHC cards for $18.00. Can you Wear Out a Memory Card? If you are experiencing frequent data loss with a memory card, it is time to replace it. There are however, a few things you can try to restore a card’s reliability.